An exciting new exhibition of artwork showcased at Sylvia Ditchburn Fine Art Gallery, Shop 7 Metro Quays, 86 Ogden St Townsville from 28 November continuing thru to 24 December 2014. Fifteen North Queensland artists are showing their work inspired by the tropics in fine art lino prints, watercolour, acrylic paintings and sculptures depicting a variety of subjects from creatures that go bump in the night - Possums, cockatoos, Orb Spiders, mud crabs, Lady Birds, beautiful blue Ulysses butterflies, coral reefs, rainforests and flowers. Must see this delightful show with plenty of ideas for your own personal space or that special gift with a difference. 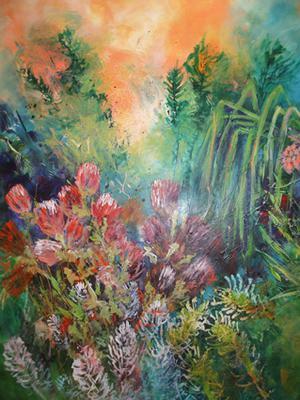 Mystical Florals is an abstract acrylic on canvas by Elise Higginson. The artist plays with the paint and outlines the found forms in felt pen. Elise is a young artist and is looking forward to pursing art as a career. Heart Reef, acrylic on canvas is an aerial view of the beautiful coral reefs around the Whitsundays Islands in the Coral Sea. This colourful depiction by Sylvia Ditchburn shows a different perspective to the tropical north. A Wild Bunch by Janet Ypinazar acrylic on canvas is a delightful romantic piece of flowers and wild bush set in front of an orange background. Janet is from Ayr and has been painting for many years. Entwined Canopy by Lusia Delli Baite , acrylic on canvas. 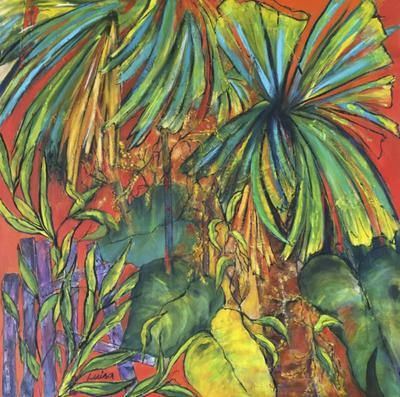 A colourful work that describes the canopy in the NQ tropical rainforest . Congratulations to Luisa who recently won awards in the Bowen and Cloncurry art competitions.